My friend Gary used to come over to my house almost daily when we were kids, but I secretly prized the times he invited me over to his parent’s place. I had more board games than he did and had gained a bit of a reputation for being a killer table-hockey player, so Gary and a lot of other kids always wanted to test me out. But Gary’s house had gadgets—lots of gadgets. By today’s jargon, I’d call Gary’s mom and dad early adopters. For example, Gary was among the first kids in school to brag about owning a color TV; he was the first to get a cassette player and a movie camera. I also remember that his folks had kitchen appliances that shined—maybe because they went out to eat a lot. Oh, and they had a car, not that this was necessarily a big deal, except for families like mine that didn’t. For me, entering Gary’s house was like walking into Walt Disney’s Carousel of Progress. Both figuratively and literally Disney has been on the vanguard of innovation since the iconic movie maker opened Disneyland in 1955. 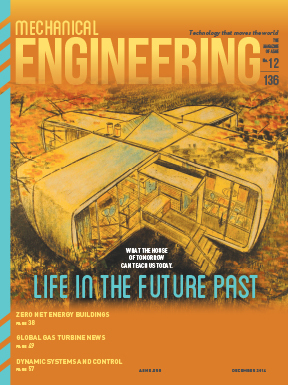 Our cover story this month, “What the House of Tomorrow Can Teach Us Today,” opens with a photo spread, across pages 30 and 31, showcasing the Monsanto House of the Future, a popular Disneyland attraction from 1957 to 1967. But the Monsanto house was more than a simple attraction, it was a presumed beacon for how we would live in the future—a future, 1986, that has long passed us. You can see the kitschy promotional video for the house at http://bit.ly/1vC9Cxt. One of the takeaways from the House of the Future is that, in some ways, technology has far outpaced even the imagination of what the future would hold. But we also see some accurate projections. The paradox of any archetype that looks ahead in time—a house, a car, a [fill in the blank] of the future—is either that the prototypes are built too many years ago to be considered futuristic today, or those created today are too fundamentally ill-informed to provide realistic projections of tomorrow. Still, they’re valuable as benchmarks of innovation. Earlier this year, Samsung introduced its own house of the future, the Samsung Smart House. It features a home environment containing technology that’s available today to you and me. You can see Samsung’s promotional video on the house at http://bit.ly/1A29EXl. Samsung’s and other visions of the house of the future are a showpiece for connectivity. They’re defined by the burgeoning buzz phrase, the Internet of Things (IoT), which delivers the backbone for interconnectivity, be it household devices or industrial chains. In a home environment, the IoT is represented by appliances controlled through voice recognition, or from outside the home through cell phones, tablets, and other mobile devices. Even as I admired the gadgets in his home, Gary and I preferred to debate the trades of our favorite baseball team more than the future of technology. Not that we didn’t daydream about space stations, visits to Mars, oversize televisions, and wristwatch phones. We didn’t think then that these things would really exist one day. Much like we don’t know today what 2015 will bring, let alone what the home might look like in 2045. This year marks the 50th anniversary of that World’s Fair and the Unisphere remains a part of the city’s recognizable landscape. Many people now probably identify it mostly as a symbol for the annual U.S. Open Tennis Championships, which is held at the park. After a few years of neglect, the Unisphere again shines brightly above the glow of spotlights and, like the old days, water flows from the fountain. Fittingly, the statement about a “shrinking globe” that defined the Unisphere when it was dedicated keeps getting more relevant by the day. Technologies far more advanced than those showcased in the pavilions of the World’s Fair continue to transform communication, transportation, education, and other areas. It was nice to visit the park again in September for this year’s Maker Faire, a collection of engineers, tinkerers, and garage inventors who were showcasing and celebrating innovation. It was a fitting location given the park’s legacy with innovation. The maker culture represents a technology-based extension of the do-it-yourself movement. Makers like to tinker in electronics, robotics, and 3-D printing as much as woodworking and metalworking. I’ve met few mechanical engineers who didn’t work on gadgets in their basements or car engines in their garages growing up, or even now. But the maker movement also has a more serious subtext. The developing world—where resources are often scarce and access to the technology that we take for granted here is limited—is full of makers. Some have become renowned, but others work silently to help build better, safer environments for themselves, their families, and their villages. We might consider some of the things that they create tools or gadgets rather than technology, but to millions of people these locally sourced innovations represent vital instruments of everyday life. At a forum on engineering for global development at this month’s ASME International Mechanical Engineering Congress and Exposition, a group of influential thinkers, who are most familiar with the nuances of the technology, economics, and politics of the developing world, will debate the ways in which those of us in the First World can help makers in the Third World usher in more sustainable technologies to local areas. The program will be streamed live on asme.org on Nov. 17. This movement is one push toward the democratization of technology, where greater access to better technology for more people leads to a better life. Since its formation in 1880, ASME’s mission has been to advance technology and safety. 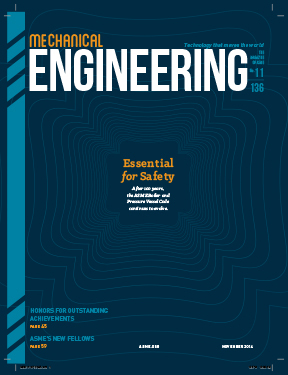 So besides noting the Unisphere’s anniversary, in this issue we celebrate the 100th anniversary of the ASME Boiler and Pressure Vessel Code, which was first published in 1914. The Code is updated regularly to focus on new challenges and extend its growing influence around the world. The Boiler and Pressure Vessel Code represents one way in which the achievement of men and women—hundreds of ASME volunteers—impact a shrinking world in an expanding universe. Finding more creative solutions to make people’s lives easier is another.